“Pinch Me, I’m Dreaming” is located in the private community of Seacrest Beach, right next to Rosemary Beach. Our home is just a short walk to the gorgeous Emerald Coast Beaches or you can climb aboard Seacrest Beach’s private beach shuttle that will pick you up at the end of the street and take you right to the beach! A leisurely stroll down our brick paver streets lined with palm trees will allow you to discover the beautiful 12,000 square foot swimming pool area with waterfalls, fountains, two bath houses and plenty of space to soak up the sun. Pinch Me, I’m Dreaming is a four-bedroom, four bath beach home that has been furnished with those special extras that will make your vacation more relaxing. The 49” LCD Flat screen TV in the Living Room will allow you to catch the game or watch a movie. The kitchen is set off by granite countertops and is fully equipped with everything you will need, whether you just want to brew an excellent cup of coffee to enjoy on the tower deck or prepare a full meal for everyone in the house. The Cottage White Queen Size Bedroom is located on the first floor with an adjacent bathroom. The laundry room is also on the first floor and features a full size washer and dryer. The second floor houses the two very large King Size Master Suites. One of the Master bathrooms features a separate shower with the incredibly relaxing overhead “Rain” shower head as well as a Jacuzzi tub. On the third level you will find the large bedroom that was furnished with our two children and their cousins in mind. It has a twin over full bunk bed and a twin bed with a pull out trundle bed which allows a total of five people to sleep comfortably in this room. 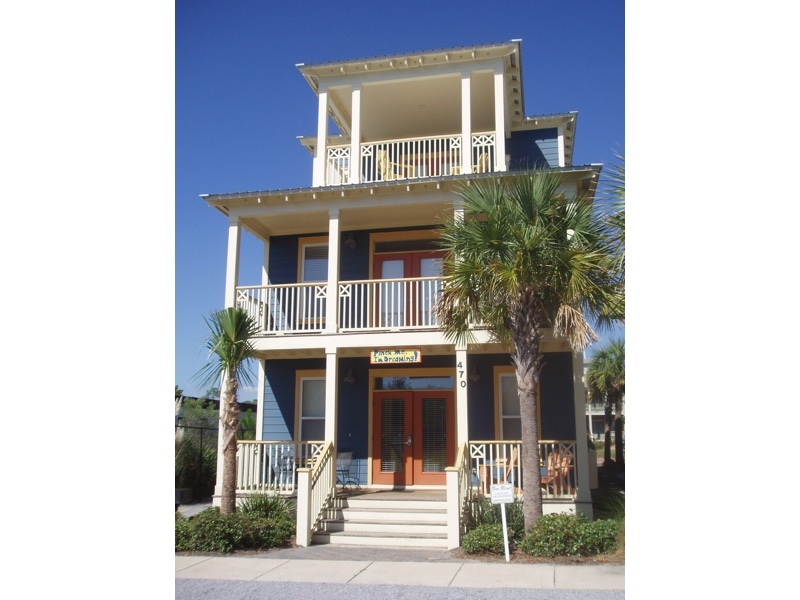 The third floor also has one of our favorite getaways in the house, the tower bar and covered deck. From the deck you can enjoy the gulf breezes and the vivid sunsets. Pinch Me, I’m Dreaming has a TV and DVD player in every bedroom in addition to the 49” Flat Screen with DVD/VCR player in the Living Room. Golf cart is available for $75/wk or $12/day.